Subei Colon is a student at Future Chefs, which is housed in a warehouse at the Boston Flower Exchange. Built four years ago for a quarter-million dollars, it has everything you’d expect to find in a commercial kitchen, including a griddle, grill, convection oven, six-range burner, fryers, multiple sinks, and copious counter space. 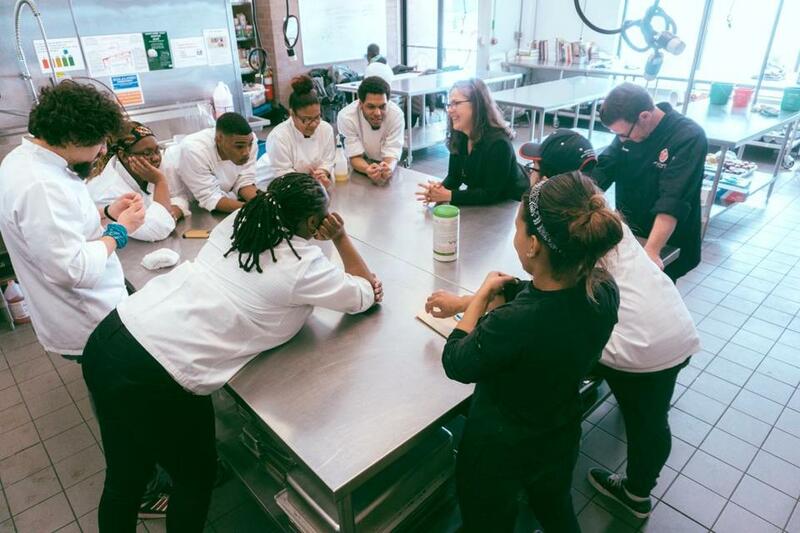 It has provided invaluable training to hundreds of students at Future Chefs, a Boston nonprofit that teaches low-income young people culinary skills and helps them find jobs at high-end restaurants. But by the end of this year, that teaching kitchen could be demolished, the victim of a redevelopment project that will bulldoze the Boston Flower Exchange, the giant South End warehouse where Future Chefs is headquartered. In its early years, Future Chefs, which was founded in 2008, operated primarily out of local high schools. But in 2012 it leased space and built a 2,500-square-foot kitchen in the Flower Exchange on Albany Street, a project made possible through donations from Harbour Food Service Equipment and Shawmut Design and Construction, among others. Last year, however, the board of the Flower Exchange — a co-op of flower distributors —voted to sell the property. And last month Abbey Group, a Boston real estate investment firm, confirmed that it had bought the facility, which it plans to redevelop into a technology office campus. That has left Future Chefs unsure of its destiny once its lease expires at the end of November. A move, said the organization’s founder, Toni Elka, “threatens to interrupt all the momentum we’ve built,” such as a new program called Future Chefs Delivers that pays students to make and deliver free, healthy food to homeless shelters and after-school programs. Future Chefs‘ founder, Toni Elka, met with students and staff. In a statement to the Globe, Abbey Group said it will honor all existing Flower Exchange leases and “development of the property will not begin until all of the leases have expired” at the end of this year. The company did not respond to specific questions asking whether Future Chefs could — as Elka hopes — be part of the new development at the Flower Exchange property, or remain a tenant-at-will after its lease expires while it searches for another location. Ideally, Elka wants Future Chefs to remain on Albany Street or elsewhere in the South End, which she considers an ideal central location. But the organization is also researching spaces in other neighborhoods, such as near Ashmont Station in Dorchester and Dudley Station in Roxbury. Elka is also talking to Leggat McCall Properties about whether Future Chefs could be part of a massive residential-and-retail complex the company is developing between Albany Street and Harrison Avenue. Bill Gause, a Leggat McCall executive vice president, said the company would like to incorporate Future Chefs into the complex and is interested in having the organization move into the first floor. But he acknowledged “a timing issue to contend with.” Namely, Leggat McCall is at least “a couple of years away from being able to move them in,” Gause said, because it first must finish the permitting and construction process. That would leave a gap of two years or more between the expiration of Future Chefs’ current lease and the earliest date it could occupy the Leggat McCall property. For now, Elka is trying to view the dilemma as “an opportunity,” she said. The organization has expanded so much in recent years that it has begun to outgrow its headquarters. Future Chefs had five employees when it moved to Albany Street but now has 12, with three more on the way. Lopez, who worked at T.W. 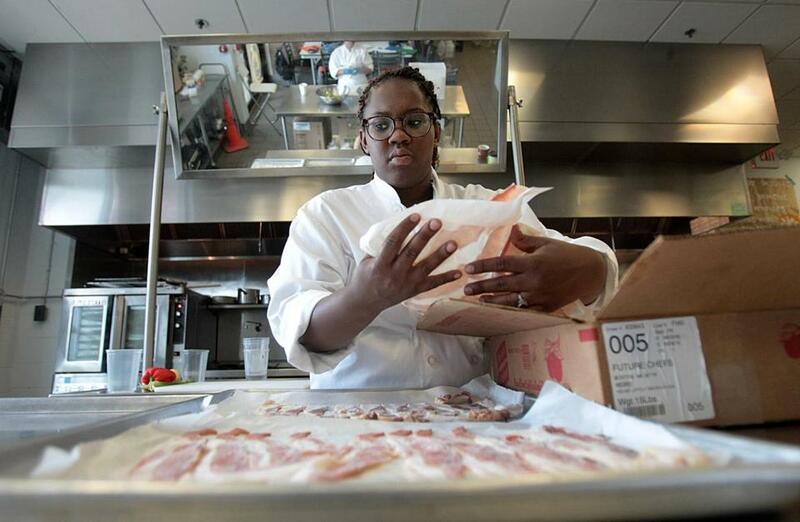 Foods and Hungry Mother in Cambridge before landing her catering job, said the training at Future Chefs gave her a sense of direction she didn’t have in high school, when she thought she’d simply get a job at a grocery store after graduating, as many of her friends had. Now, she said, thanks to encouragement from the organization, she hopes to become a head chef and eventually own a restaurant.